City settles contract with firefighters, SAFER grant to reopen Fire Station #6 | Audio and video stories from Southwest Washington. In a timely two-step decision, the Vancouver City Council approved a four-year collective bargaining agreement with the Vancouver firefighters’ union Tuesday night, then immediately elected to spend a two-year, $2.3 million federal SAFER grant to reopen and staff Fire Station #6, located at 3216 NE 112th. The labor agreement between the city and IAFF Local 452, retroactively beginning in 2010, lasts until 2013 and includes no cost of living or salary increases this year, followed by a 3.7 percent pay increase in 2012 and a two percent increase in 2013. At one time, the union had sought more than eight percent in salaries and cost of living increases. According to the city manager’s office, from now until 2013 union members and their dependents will no longer participate in the city’s health care program, instead creating a trust into which the city will pay a fixed fee per member each month. In 2011, the city will pay $1,320 per member, and increase that amount by 5 percent in 2012 and again in 2013. “It gives the opportunity to craft a plan that meets the immediate need of employees as well as meeting the city’s interest in containing the pace of growth and cost at 5 percent,” said city manager Eric Holmes. Mark Johnston, president of the Vancouver firefighters’ union, said that 80 percent of union members ratified the agreement. With the collective bargain agreement settled, the council was able to turn to the issue of the SAFER grant, which it had received in March as a way to reopen Fire Station #6. The city had closed the station in January 2011, due to budget cuts. The grant would support 13 firefighters for two years. However, the grant also stipulated that the city maintain current staffing levels in the entire fire department during the life of the grant. Neighbors and friends of the station regularly lobbied the council during the spring and summer to accept the grant. However, the City Council was unwilling to commit before ironing out the collective bargaining agreement with the firefighters’ union. The council had until Sept. 1 to allocate the grant funds or return them to the federal government. Even knowing that funding is temporary, neighbors of the station are relieved. While council members praised the work of city staff and representatives of the IAFF, Local 452, they acknowledged that the SAFER grant offers temporary reprieve. 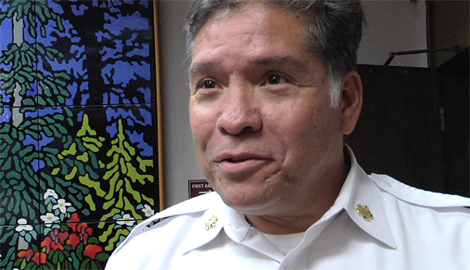 Vancouver Fire Chief Joe Molina said the new firefighting staff of Station #6 will begin training next week, and the station should be operational within eight weeks.